A blue crab hides in a bed of widgeon grass. The Chesapeake Bay watershed provides food, water, protection, and nesting/nursery areas to more than 3,600 species of plants and animals. 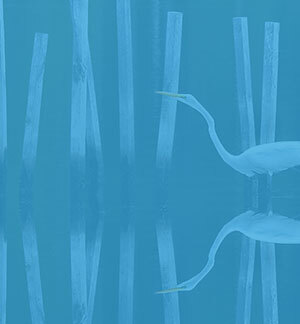 Fostering a healthy habitat—from the hardwood forests of the Appalachian mountains to the saltwater marshes of the Bay—is vital to restoring the health of the Chesapeake Bay watershed and the life that depends on it. 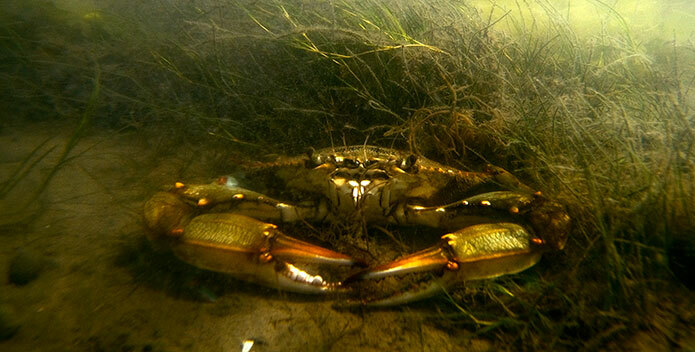 Increased Pollution: Excess nutrients deplete important underwater grasses and other Bay habitats that provide protection for the iconic blue crabs and other critters. Furthermore, these harmful pollutants often end up choking our waters of necessary oxygen that Chesapeake critters need to survive. Development: Over the past 15 to 20 years, development has been the largest cause of forestland loss in the Bay watershed. Between 1982 and 1997, 750,000 acres of forestland were developed—a rate of about 100 acres per day. This loss leads to the loss of air and water filters, wildlife habitat, and other significant functions that forests provide. Development also causes more sediment pollution to run into and muddy our waters and Bay throughout the initial construction phase. Climate Change: Average sea levels in the Chesapeake Bay have been rising due to climate change and naturally subsiding coastal lands, resulting in submerged or lost habitat. At least 13 islands have disappeared entirely in the Bay already; many more are at risk. It's natural low-lying topography coupled with its growing coastal population make the Chesapeake Bay especially vulnerable. In order to combat these threats and restore vital habitat for Chesapeake creatures, CBF works on farms, along rivers and streams, and in the Bay, to plant underwater grasses and trees, build streamside buffers, and restore and build oyster reefs.